My niece Christine tried this recipe and said it was absolutely delicious. It turns out that it is totally fat free and only about 150 calories per slice. You can add a few fresh sliced strawberries and whipped topping for a real summertime treat. In the words of the late Jackie Gleason, "Oh! How sweet it is"
Put dry cake mix in bowl (do not add the water as directed on the box). Add entire can of pineapple with juice. Mix carefully until all dry mix in incorporated. Pour into either a tube pan or 9x13 pan sprayed with vegetable spray, or cupcake pan with liners. Bake at 350 degrees for time indicated on cake mix box for size pan (approximately 30 minutes). When sides pull away from pan and toothpick comes out clean, cake is done. Note: You can also use low calorie cherry, blueberry, or lemon canned pie filling instead of pineapple. Tip from Christine: Use a bigger bowl than you would normally use for a cake mix. 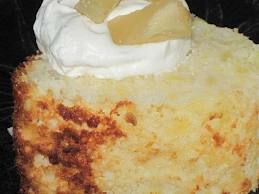 When the cake mix starts to absorb the juice and pineapple it becomes very frothy and GROWS!! !